Identifying unique team building activity ideas can sometimes be difficult, but here you've found the mother-lode! In this chapter we focus on the topic of infusing fun into the workplace. 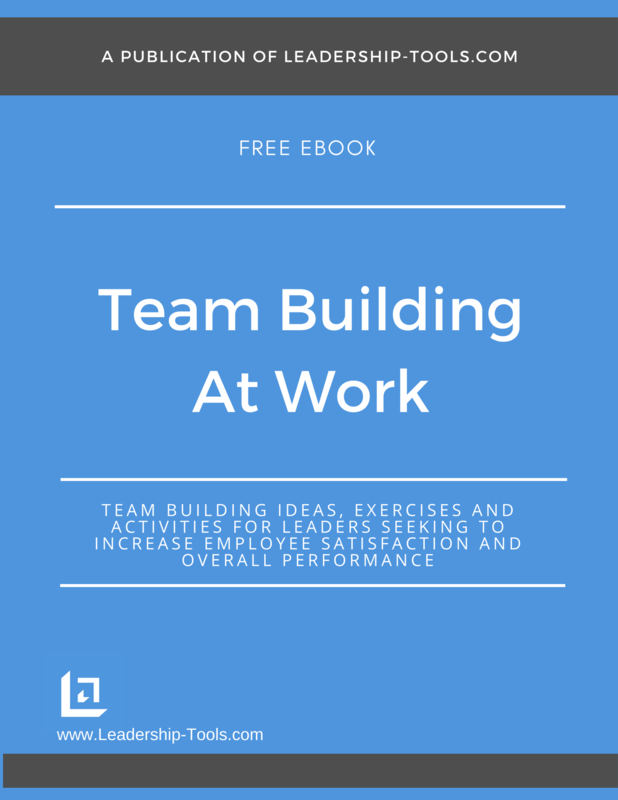 Our free eBook, Team Building At Work, is available for immediate download. 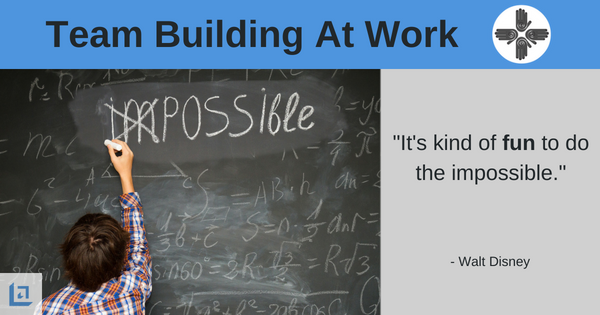 Many leaders downplay the important of having fun in the workplace, but the fact is that when work is fun, it doesn't "feel" like work, and that is when you know your people are passionate about what they are doing. Without clearly defining fun that is appropriate to the workplace, however, sometimes it can be a fine line that a leader must walk. On one hand you want your people to enjoy their work, but you are also concerned that people maintain a level of professionalism. You might also hesitate to encourage a fun atmosphere out of fear that fun activities will keep your team from producing at a maximum level. However, you can safely put those fears aside as we are providing a solution that everyone should feel good about. The key to helping your team define what "fun" means is to first clearly define it for yourself. Don't worry, we've put considerable thought into this question so you don't have to. The definition for fun that we came up with is probably not exactly what you will expect, but we think you'll like our version because it's also very conducive to a productive work environment. Working as part of a team environment where people are challenged, they learn new skills, they grow, they seek opportunity and advancement, they take risks, they ask forgiveness - not always permission. People with these traits make an organization grow - these people succeed more often than they fail - and they ultimately reap the rewards and recognition of one who consistently achieves strong results. Team members having fun stay motivated with the knowledge that they are the exception to the common rule of human behavior. They’ve taken ownership of their mood and disposition. Ultimately, they are having FUN because they make a difference and a valuable contribution to their team - they simply do not allow themselves to settle for the status quo. These employees would rather work hard and experience "full engagement" - because being engaged is what makes the job worth doing. Working hard, getting results and experiencing the rewards that come with success and achievement – NOW THAT’S FUN. Good luck, and have fun as you teach your team important lessons using the following unique team building activity ideas. Purpose: To add fun and energy to a team meeting. To assist with product knowledge retention. Explanation: Leaders should check in and inspect the product knowledge of their employees on a regular basis. This unique team building activity is a fun way to review and inspect the product knowledge of your team members. Choose a physical object that can be quickly passed from one employee to the other. Objects might include a ball or stuffed animal. This object is your HOT POTATO, so make sure it's not to heavy. Gather your team in a circle and explain to them that the object of the game is to NOT get caught with the Hot Potato. Whoever gets caught with the Hot Potato after 2 minutes of play, will be asked to complete a task no one else wants. With your team members in a circle, set your stop watch for two minutes and inform your team that you’ll be asking product knowledge questions. As soon as one person answers a question correctly, he or she can quickly toss the Hot Potato to another employee. It’s now that employee’s turn to answer the next question. As the 2-minute time period approaches, you read your questions quickly so the person answering the question has time to answer. If you run out of time in the middle of a question, allow the person to answer the question. If she answers correctly, she does not have to keep the Hot Potato, but if she answers incorrectly she is the Hot Potato winner! You can be flexible in determining how many rounds you choose to play. Use this unique team building activity to engage your employees and infuse a little bit of fun into an otherwise mundane review process. As always, for those employees who demonstrate a high level of product knowledge, make a point to recognize them for their commitment to excellence. "I don’t believe in team motivation. I believe in getting a team prepared so it knows it will have the necessary confidence when it steps on a field and is prepared to play a good game." Purpose: To provide a fun and entertaining way to engage your employees and effectively reward and recognize top performers. Explanation: Whenever you have an opportunity to reward and recognize your employees, you can easily elevate the level of energy and excitement by making your presentation into a competitive exercise such as this unique team building activity. First, identify your top two performers for any certain task or area of performance. "Live and work hard but also remember to play and have fun in life." Recognize each individual for their performance. Be specific in your praise and give clear examples of what each employee has done to be deserving of your recognition. Explain that both top performers have won an opportunity to win a larger prize. It can be something as simple as movie tickets, lottery tickets or a bottle of wine. Bring out two hula hoops. Have each team member try out the hula hoop. Give them a minute or so to practice and prepare for the exercise. Keep in mind, most people haven’t played with a hula hoop since they were in grade school. Watch the team observe these top performers as they practice their hula hoops. The fun has already started! Instruct each top performer to get ready, get set, GO! The person who can hula hoop the longest will win the Prize. This simple activity is a sure-fire winner for injecting FUN within the team. IMPORTANT NOTE: If a top performer is not physically capable of using a hula hoop, or you think they would be too embarrassed to do so in front of the group you don't want to put them in an uncomfortable position so here are a couple other ideas that you can use for the same exercise. Play a game of checkers, but use a timer, giving each person only 10 seconds to move each piece. The winner of the game wins the prize! As you can see, the type of game or activity is not that important. The main thing is that you set up an environment for some friendly competition that also provides an opportunity to reward and recognize your top performers in front of their peers. Try this unique team building activity at your next staff meeting. 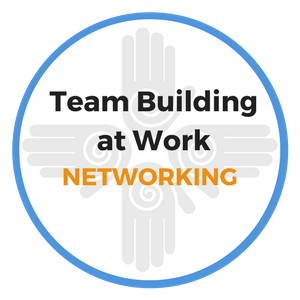 To download our free Team Building At Work eBook, packed full of unique team building activity ideas and exercises, simply subscribe to our free newsletter. You will immediately receive a password that grants access to our entire leadership tools library.